In early June, fellow Journal Sentinel community columnist Steve Paske published “What Milwaukee needs is some brimstone,” a column on his impressions on religious fervor among Milwaukee’s inner city school children. Paske is a Milwaukee Public Schools teacher, a prolific writer, and in my humble opinion, the best community columnist ever. He’s written a number of excellent, thought-provoking, out-of-the-box commentaries, particularly on education in MPS. I seriously think he should be a permanent Journal Sentinel columnist. I’m only a little jealous. “It seems many of you appreciated my targeting the “immoral and repugnant” society of Milwaukee’s central city. You unabashedly agreed that in addition to the message of faith, a message of morality must be preached. You decried the violent and promiscuous behavior of many in the central city. Then you got up from your computer and returned to the posh lifestyle many of us take for granted as Americans. Even though a New Testament verse quotes Jesus as saying, “It is easier for a camel to pass through the eye of a needle than for a rich person to enter the kingdom of God,” some of you felt totally at ease criticizing the morality of another class of people. Which is funny because as a middle-class American, you easily fall into the top 10% of the Earth’s wealthiest. If as many people truly believed in the Christian God as say they do, the problems of the world wouldn’t be a hundredth of what they are today. Really, I would like to copy the whole column, but I don’t have Steve‘s permission, so you should really just read it at the link. I don’t consider myself a “Christian” in any defined sense anymore, and many of the reasons for that are tied into what Steve is talking about. If one really, truly believes the passages in the Bible are true, and that the words of Jesus are to be followed, that person has a mandate to become a radical activist for the poor and helpless in their society. That person would not hesitate to take any homeless person on the street and offer them the best room in their house; would “turn the other cheek” in ways that most Americans, particularly in our post 9-11, ultra-paranoid, security-happy society, would find appallingly foolish; would in fact not condemn prostitutes and drug dealers, but eat and drink and minister to them. That is what Jesus would do, and mostly white, mostly wealthy, mostly suburban America, locale of hundreds of the fastest-growing Evangelical mega-churches, looks nothing at all like Jesus. I, like Steve Paske, am not saying I live in the way Jesus would, but I also don’t claim to. “So on the eve of the first make-or-break test vote in the Senate, it is tempting to wonder about the haste to pass immigration legislation now, with a narrowly divided Congress and a weakened president. With the passions raised by right-wing talk radio and anti-immigration TV zealots like Lou Dobbs, there would appear to be a robust argument for waiting for a more opportune moment to attempt to liberalize the nation’s immigration laws. Read Hitting a wall on immigration in its entirety here. I can appreciate the difficulty in waiting another few years for a reform bill, but I’m opposed to many fundamental parts of the current S. 1639. I also feel it is disingenuous for progressives everywhere to support this bill simply because it’s the supposed best we can do. It’s not the best we can do. More on that later. It’s fast, and easy to navigate, but it is also empty. You will have to re-register. Most of the posting was lost in transition, although a lot of the important I-601 information will be added to the site as the administrators have time. Thanks to Marie and Xandrick for keeping this great site up and running! I’m having a really hard time concentrating today. This weekend was a whirlwind of activity and home improvement. Birthday dinners for my brother, a housewarming party for an old friend, and lots of prying tiny (pinche!) nails out of my stairs. I’m somewhat frantically trying to get my upstairs loft completely carpet- and staple-free before the floor refinishing folks come tomorrow. After they finish working on Thursday, it’ll be time to get the final coat of paint on the walls, get everything put back into place, hopefully hang some pictures, and then get ready to leave next Friday for Ciudad Juarez. I need maps, I need phone numbers, I need to launder and pack and make sure my housemates have specific directions so that my plants are alive when I return. I’m still somewhat worried about a life-altering change of plans that could possibly befall us in Ciudad Juarez, but unless that happens, I can’t really discuss it here. In other words, Tuesday July 10th will be a big day. If all goes well, we’ll be out of Mexico by the evening, ready for a new, stabler life where we will be able to travel at will and not worry about a freak deportation or not getting a job because of a Social Security number mismatch. I’ll be blogging as much as I can during the trip… stay tuned. There are tons of better reasons to support the rights of working immigrants than the demise of the Republican majority in western states the issue is causing, but here’s an interesting commentary on the situation anyway. Because it requires access to New York Times Select, I’m posting it all. He was loud, he was blustery and he was clear: our country is being overrun by Mexicans. To back his bark, he wrote, “Whatever It Takes,” as subtle as a cactus poke. He had money, and he had the power of office, a 12-year incumbency. In the end, J. D. Hayworth, a Republican, was kicked out of his Congressional seat here last year. In the glossy white suburbs of Phoenix, immigrant-bashing backfired. Farther south, in a district that is ground zero in the border wars — the seared-over patch of Arizona desert where the Minutemen patrol, more Mayberry than Concord — another Republican took an even harsher stance. The anti-immigration extremist, Randy Graf, was crushed. For Republicans in Arizona, the result was a net loss of two Congressional seats. Americans are genuinely conflicted and troubled about porous borders and the 12 million or more illegal immigrants in our midst. But to hear politicians who have been scorched by the blowhard fringe tell it, they’re facing a tidal wave of opposition to a consensus change in the status quo. Last week, Senator Trent Lott, the Republican whip, blamed talk radio for the possibly fatal collapse of the immigration reform bill. Still, on the air it’s open war against the browning of America — tinged with slurs that disrespect all Hispanics. Consider Hayworth, who gives helium a bad name. Ousted from his seat, he now uses the megaphone of a Phoenix talk station to promote his solution: all undocumented immigrants would be given 120 days to leave the country — or face a massive, forceful roundup and deportation. Right. And this would be done, no doubt, by the same people who couldn’t stop a single tuberculosis carrier from entering the country. The syndicated talker Neal Boortz chuckles at the human collision along an advanced border fence. “I don’t care if Mexicans pile up against that fence like tumbleweeds in the Santa Ana winds,” he said on Monday. And two hosts of something called the “Patriot Radio News Hour” here mocked the Hispanic Games, held last weekend in Phoenix. They suggested “jumping the fence” and “leaving the scene of an accident” as competitive events for Latino athletes. Ha-ha. Democrats are laughing all the way to a new Western majority. In 2004, they picked up a Senate and a Congressional seat in Colorado, with two Hispanic brothers in cowboy hats. And they did it with counties where an NPR liberal is hard to find. Some Republicans know this. Nationwide, Hispanic support for Republican candidates dropped 10 points from 2004 to 2006 — to about 30 percent of the vote. Yes, this state’s two Republican senators, John McCain and Jon Kyl, favor the comprehensive immigration bill. And yes, President Bush is the bill’s chief proponent. But pragmatism is being drowned out by the bullies with electronic bullhorns, who’ve got their party leaders running scared. “If they get their way and the bill dies, so too may Republican electoral prospects for the foreseeable future,” wrote Clint Bolick, a conservative scholar, in The Arizona Republic this week. Remember that prediction on Election Day 2008. Well, as anyone who’s been around here awhile knows, Fermin (my Poblano Mexicano husband), has been in his hometown since August, waiting for processing of our I-601 waiver of visa inadmissibility. We were approved on May 4th, and I received notice on May 11th. July 10, just a few weeks away, has his second appointment at the U.S. Consulate in Ciudad Juarez, the sister city (over the border) with El Paso, Texas. 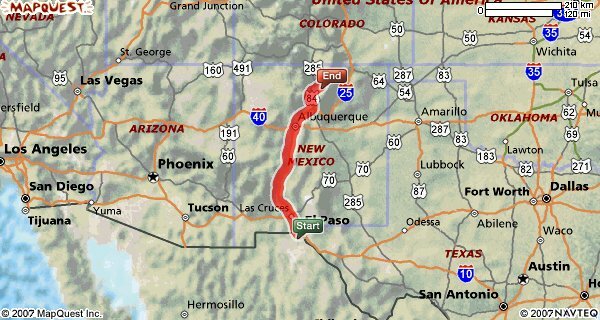 I have decided to drive down for the appointment, stay in Juarez for the two days we will need to be there, and then we’ll take a scenic route through New Mexico and southern Colorado before heading back to Wisconsin. Yes we know it will be a LOT of driving, and that I am not saving any money compared to flying. Journey I: me, myself, my Elantra hatchback, and my iPod. 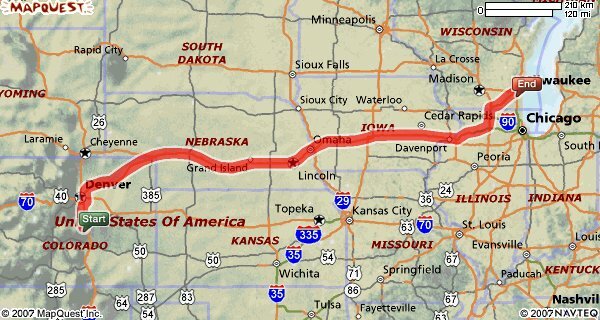 I’m hoping to leave Friday afternoon July 6, drive to St. Louis, and stay overnight. In the morning I’ll take some photos of the Arch and drive for about 12 hours. 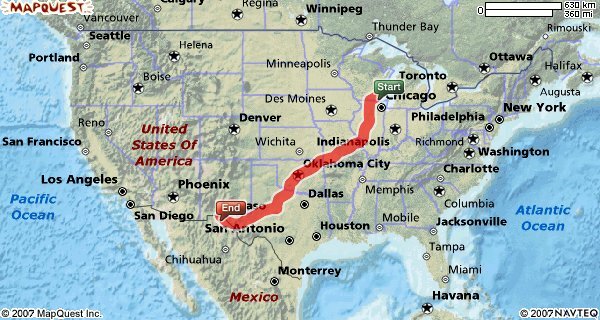 I’ll stay somewhere in Texas, then drive the final 6 hours Sunday morning. Fermin will arrive in Ciudad Juarez about the same time I will, which will work out well. We’ll get to meet my internet-friend Adriane and her husband, who are living in Ciudad Juarez, and spend most of Monday just hanging around. Tuesday, assuming all goes well, we’ll get the visa and spend the night somewhere in El Paso. Then comes the fun. I don’t want to book any hotels because the “what ifs” are still gnawing at the back of my mind, but we’ll have a few days to leisurely drive through New Mexico, stay in Taos, I decided tonight, and then head to Colorado Springs. By Saturday we’ll have to be heading back to Wisconsin, so it’s definitely a very short trip, but it’ll be fun to hang out and see some of the country’s most beautiful places (even if a lot of it will be by car). If I had vacation time, I’d use it now, but I’m already taking an unpaid week to do this trip, so that’s all I can afford. Journey III: Through the corn, back to the Midwest. Then we’ll be back. We’ll hopefully surprise his family that is here on Sunday, and then start life, back to normal. As an aside, I’m hoping to meet some people with some interesting stories around the Consulate, so I’ll definitely be attempting to take a little time out for blogging. No guarantees though. Milwaukeeans out there may have seen the news stories about Oscar Ayala-Cornejo (most recent news story and links to earlier ones), an undocumented immigrant from Mexico who took on the identity of his deceased, U.S. citizen cousin in high school, and since went on to become a Milwaukee police officer. After his real identity was leaked to the police department in early June, Ayala-Cornejo was arrested, then released on bail, and has now been convicted of falsely impersonating a U.S. citizen. He faces a jail term and subsequent deportation. I’m itching to talk to this guy, but I don’t know if it will happen. Milwaukee Journal Sentinel Editorial Editor O. Ricardo Pimentel has written a great column on the man’s punishment and the parallels this situation has with the greater national immigration debate. Andrew Leonard, of Salon.com’s How the World Works, has predicted that Lou Dobbs will continue to aid in corroding the base of the Republican Party by spewing his extreme, fanatical views on immigration to millions of viewers. Immigration is a divisive issue for both parties, but there is a lot of talk of how big business, which clearly has an interest in either a) maintaining the status quo or b) passage of a reform bill that will legalize those in the country illegally AND create an immigration system that will meet the nation’s future economic needs. The Lou Dobbs, or Tom Tancredo types, want all the “illegal aliens” out ASAP, no matter what the cost, because clearly, they are taking over America in every way, and we need to preserve all that is righteous and good and pure about our white, male, Christian power structure. (Yikes, I so just mixed a whole bunch of crap into one big ball there). As I follow the immigration debate, I note that among the parties involved there is a passionate desire for the United States to secure its borders. This seems odd to me since national boundaries generally do not exist in the physical world; they are products of the human imagination. Any photograph of the Earth from space will not show evidence of such a border anywhere on the globe. Any physical evidence of a national border, whether it be the Berlin Wall, a fence near the Rio Grande or the Great Wall of China, is simply a manifestation of human fear and aggression. National borders tend to be temporary and fluid; ask any European about that. A national border is a clear sign of the failure of men to get along with each other. The burning desire to defend our country’s borders is evidence that we are incapable of working amicably with our neighbors. The sanctity of national borders also seems to be a matter of convenience for our nation’s leaders. Apparently some borders are sacred and some aren’t. Our border with Mexico appears to be crucial, but Iraq’s frontiers weren’t nearly so important when we invaded that country in March 2003. Once again, I would suggest that borders are in our minds and nowhere else. You are currently browsing the one step closer blog archives for June, 2007.